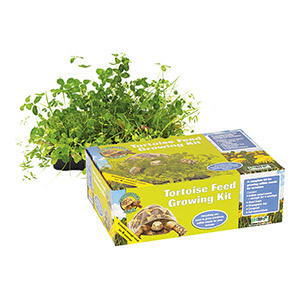 Tortoise food growing kits to grow you own fresh tortoise food. These excellent little kits will give fresh tortoise food all through the growing season (April to September). Included in the kit is enough edible weed seeds for 4 sowings (more than enough for a years tortoise food), two seed trays to enable cycling of the tortoise food and a propagator top, more than enough compost for four sowings and full instructions.So everything you need to grow nutritious, edible weeds for your tortoise. Simply sow both trays and grow the food. Place one tray in with the tortoise and when it has cropped that one down, replace it with the other one and place the cropped one back in the light to regrow. These grow well in a sunny position indoors or out. Just keep well watered. 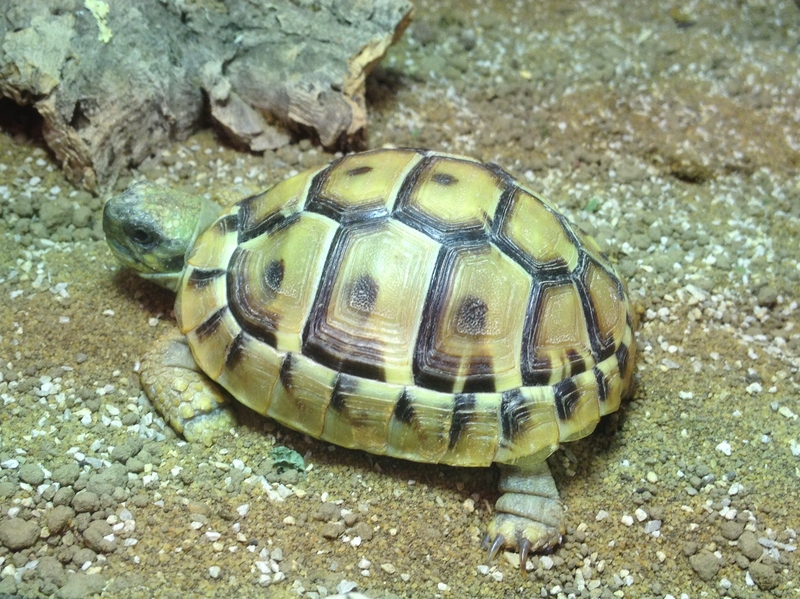 The commonest tortoises kept in the UK have similar nutritional requirements. The general feeding information here holds for Horsfield’s, Hermann’s, Mediterranean spur thighed and marginated tortoises. All need a diet that is low in protein and sugars and high in fibre and calcium. In the wild the available tortoise food changes over time. In the spring, when they come out of hibernation there is lush growth of fresh shoots. As the year progresses, especially in the more arid parts of their range, the vegetation gets tough as the heat increases and the climate gets dryer and in some parts of the range the tortoises will aestivate through the heat of summer (hide away and become in active). When the rains come again in Autumn, fresh growth occurs and the tortoises feed up ready to hibernate over winter. It is at this time of year they will also eat fallen fruit, so only for a short period do they eat high sugar food. Wild tortoises will selectively feed on a mixture of lush growth and higher fibre coarse growth to maintain a balance of low protein and high fibre in their diet. Wild tortoise food also tends to grow on underlying rock that is high in calcium and they will even eat small pieces of rock from the soil to supplement that taken up by the plants. A captive tortoise’s diet should represent that of its wild counterpart and the tortoise food growing kit provides part of that varied diet. 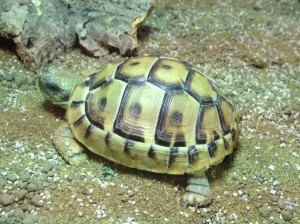 To order tortoise food growing kits visit our website or call us on 01452 501882. Pet Shop Gloucester tips. 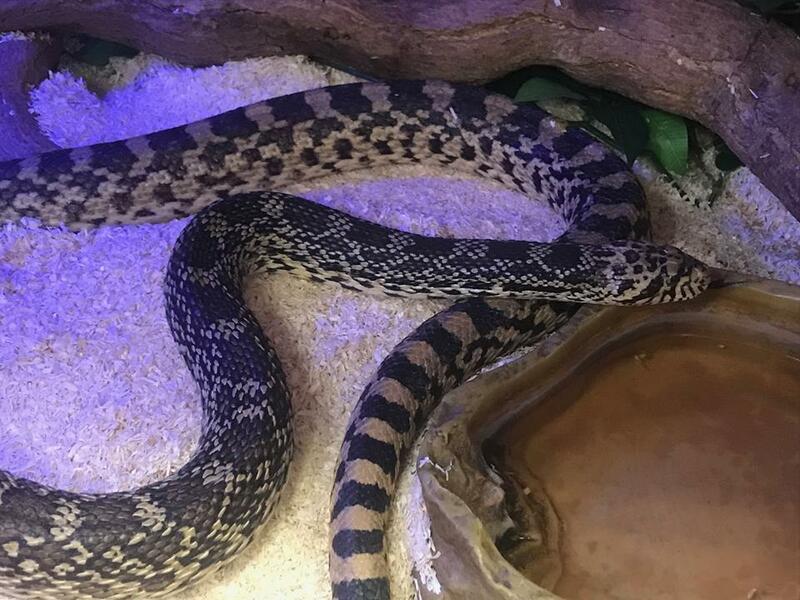 Just a brief post on 5 top tips on handling NON VENOMOUS snakes from your favourite Gloucester pet shop. If your snake has just fed, DON’T HANDLE IT. Handling a snake after it has just fed can be at best unpleasant and at worst dangerous. Snakes swallow their food whole and rely on strong stomach acids to break it down. Whilst this happens relatively quickly, for the first 24 – 48 hours the snake has a large, hard object in a small, confined space. In the wild they would lay up during this period and allow the acids to do their work. Handling causes the snake to move around and this puts pressure on its stomach (or in the case of inexperienced handlers they may actually squeeze the area). 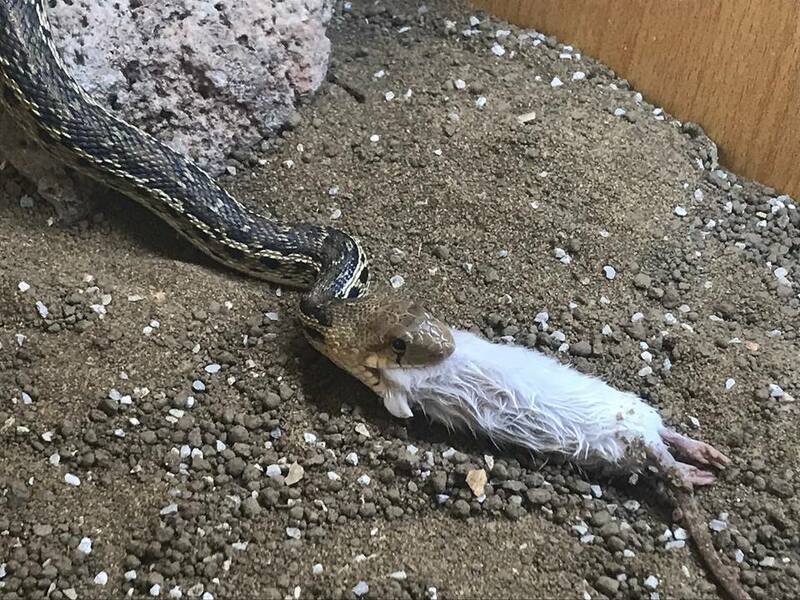 This action can make the snake regurgitate the meal (if it hasn’t already as a threat response), bringing up the very strong stomach acid with it, which can cause damage. Even worse, if the snake doesn’t regurgitate and the meal is still undigested other internal organs can be damaged by the pressure, if handled roughly (or dropped). Then of course there is the risk to you. Even a docile snake may strike when it has just been fed or is digesting its meal. It knows you shouldn’t be picking it up even if you don’t. For more advice on feeding snakes come and see us in our pet shop Gloucester. If your snake is shedding, DON’T HANDLE IT. It’s not so much that it dangerous for the snake (although it may lead to incomplete shedding) but with its eyes clouded over it can’t see. Would you be in good mood if you suddenly had one of your senses taken away? The snake still has other, very accurate senses, so it can and will tag you. 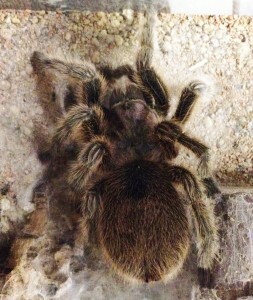 For more advice on problem shedding come and see us in our pet shop Gloucester. So assuming your snake is not shedding and has not been fed within the last 48 hours the most important things is to BE CONFIDENT. Most people who keep snakes will tell you the snake can sense it if you’re nervous. I don’t think they have any ability to sense nerves in you at all, however they can pick up on your body language. If you go in with a hesitant hand, that’s shaking or moving in then pulling back etc. the poor old snake doesn’t know what is going on. When they are unsure of a situation they naturally get defensive and may well strike. I can and have, on several occasions, demonstrated this in the shop where I can simulate a nervous owner and get even a cornsnake to strike or conversely, be confident with a rather nippy kingsnake and not get tagged. In fact someone once brought such a kingsnake into the shop, complete with viv. (as they couldn’t get the snake out, it was so aggressive). The snake was hissing and striking at the glass. I opened the viv. picked the snake straight up and it was quite calm. The owner then hesitantly took the snake off me and promptly got bitten on the neck. Which takes us to the next point. 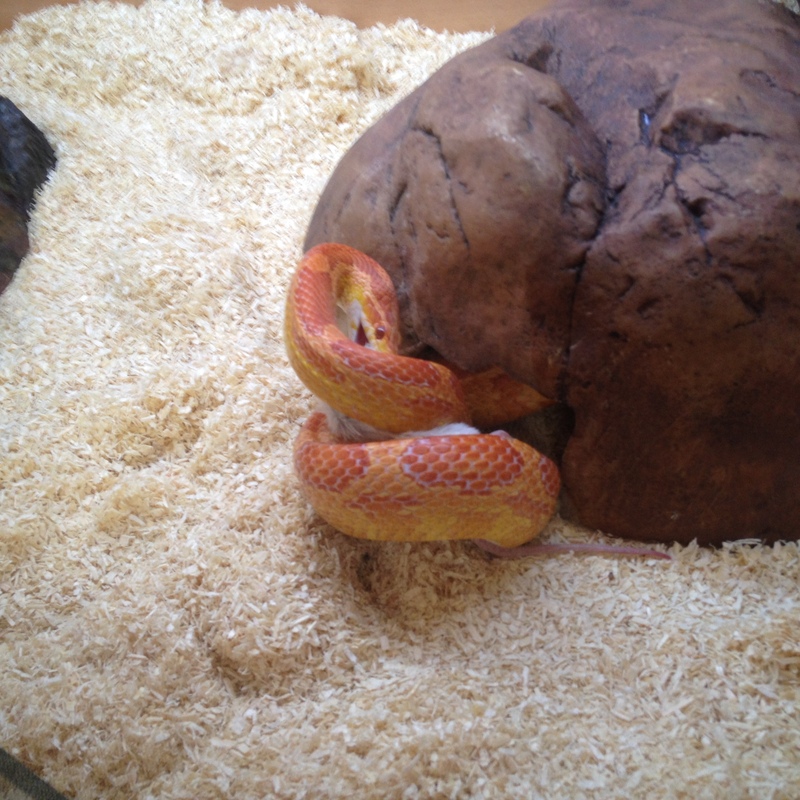 For more advice or demonstrations on snake handling come and see us in our pet shop Gloucester. Keep the snake away from your face. If a snake does bite it should only be able, at worst, to get your hand. If it gets anywhere else, guess what? That was your fault. Staring up close into the face of a snake is a bad idea. Snakes are carnivores, their senses for the most part are binocular and forward facing in order to judge direction, distance and to strike accurately. This means they are particularly sensitive to anything immediately in front of them that moves. If you wave your hand about in front of your snakes head, or worse your nose (especially if it’s as big as mine) you are much more likely to get tagged. Also all reptiles can carry salmonella. Letting a snake touch your face near your mouth (i.e. kissing it!!) is really a bad idea. For more advice on being bitten by snakes (especially if the snake won’t let go !!) call us at our pet shop Gloucester. Wash your hands afterwards. As stated, snakes can carry salmonella. This bacterium is quite likely to be found on the snakes skin. They poop in the viv and move around – it will transfer bacteria onto its skin. You will be letting the snake run through your hands, you will touch it near its cloaca (vent) where the poop comes out so you will get bacteria on your hands. If you don’t wash your hands immediately you will be transferring bacteria everywhere you touch. Salmonella is a dangerous infection, potentially fatal in infants, the elderly and immune suppressed individuals. If you are fit and healthy you will survive but you will never want to get it again. I have had the disease. It is unpleasant, debilitating, incredibly painful and will take some time to recover from. All you have to do to avoid getting it, or giving it to your family, is wash your hands, preferably with an anti bacterial hand wash. We sell them, so you have no excuse. Also some snakes carry diseases that can be passed onto other snakes, the one that springs to mind is IBD (inclusion body disease) that can infect boids (pythons and boas). It is highly contagious and always fatal to the snake. Always disinfect when moving from one boid viv. to another or any other enclosure for that matter. Cross contamination by the owner is the commonest vector for the spread of mites, for example. An alcohol hand wash will kill any eggs on your skin (it dehydrates them) as well as any bacteria and the mechanical action also helps lift dirt that is harbouring other pathogens. I hope these tips are of use. If you have any more questions or need more advanced help with anything just get in touch with our pet shop Gloucester and we will try to help. Iguana. The very first thing to consider when buying an iguana is its adult size. The commonest species, Iguana iguana gets very large. Females around 5 feet, males 6 to 7. Even though a lot of this is tail they are still a large and bulky lizard. Eventually they are going to need a very large enclosure (small room size) so don’t get one if you can’t accommodate this amount of space. If you are sure you can then read on. The next thing is longevity. 12 to 15 years is the norm, 20 years is possible in captivity. So the room you have decided to set aside for the iguana when it reaches adult size needs to remain a “spare room” for that length of time. One of the commonest things we hear is “Do you want my” boa, python, monitor lizard, even bearded dragon. “We’ve a baby on the way and we need the room now”. Things change, who knows what they are going to be doing five years from now, let alone 20. You need to factor your responsibility to your animal into your plans. If you have the space and a contingency if things should change then read on. An adult iguana is a large animal with powerful jaws, claws and a long tail, which it can use as a very effective whip in defence. Regular short periods of handling when young, so the iguana gains confidence in its owner, will stop it getting truly aggressive but you need to be confident in yourself in handling a large animal. 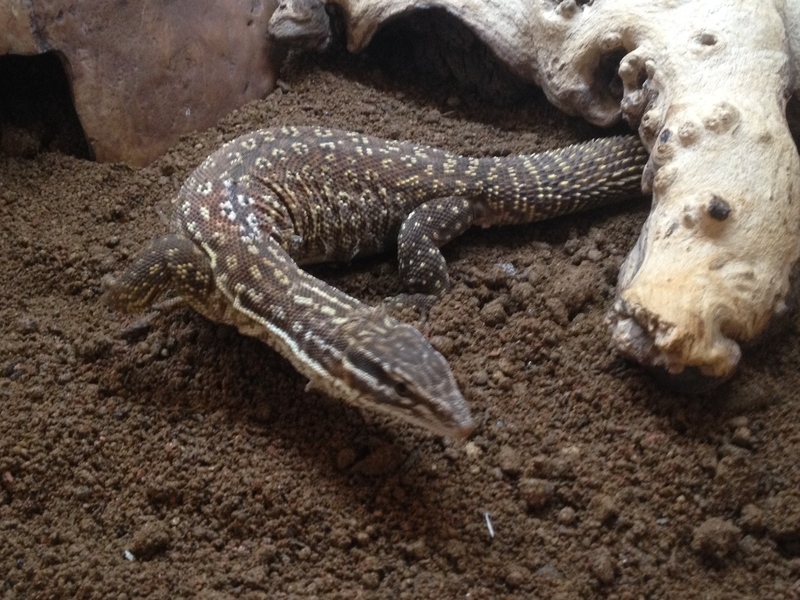 If you have never owned a lizard before (they are very fast as well, especially as youngsters) then think about getting something a little easier first to gain experience. OK, you’re confident you have the space, can accommodate the iguana in any changes that may occur and are sure you can handle such a large beast, what do you have to do to look after it? Firstly source your iguana. Get a captive bred one. They are generally more docile, do better in captivity, don’t come with a full load of parasites and you will not be contributing to environmental damage. If you buy one on line or on social media from someone who just needs to “get rid” then how confident are you going to be that such an unwanted iguana has been properly looked after. Of course this is true of any animal, not just an iguana. I have seen corn snakes that have been kept in shoe boxes under the bed and just chucked a mouse every few weeks when the “owner” has remembered, bearded dragons with MBD because the UVB lamp has never been changed since they got the lizard, so called breeders who don’t even have the necessary equipment for the babies so just try to sell them off as quickly as possible so they don’t have to get any and so on and so on. 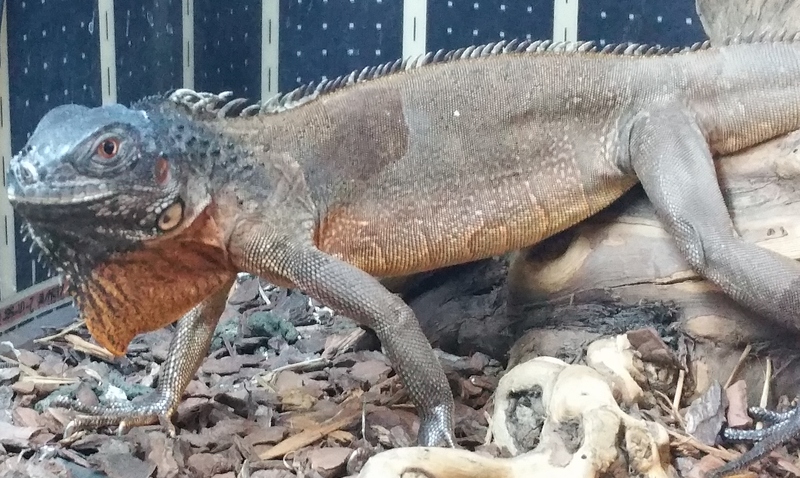 Make sure you are using a reliable source, that has a premises you can visit and see the iguana as they are being kept and have the knowledge and experience to give you the advice you need and importantly, with a written iguana livestock policy. If the seller cannot give you the information you require, don’t buy from them as they cannot have been looking after the iguana properly themselves and you could be buying a problem. If there is a problem, how likely is it you can return the iguana? We want to see you too. We don’t sell our animals on line as we feel we have a responsibility to the iguana not to be selling it to someone who cannot look after it. Buy from someone who knows and who cares. As already discussed your are going to need a very large enclosure (up to 12’x6’x6′ for a large adult male iguana) eventually. However a baby iguana is going to look lost in such an enclosure and there are other reasons for starting out in a somewhat smaller vivarium. Firstly it is supposed that a baby iguana can sometimes find it difficult to find the food and water in a large enclosure. Certainly not the ones we have had! Also you wonder how the wild ones get on outside. I think that is maybe truer for animals that have to hunt insects. That said, why take a risk when there are other reasons to start smaller. Catching a nervous baby iguana is not easy in a large space. I am getting on now and bending down is not as easy as it once was. I had to try to catch an iguana in the shop that escaped whilst a customer was viewing it the other day and could only do it once I had in cornered in a smaller space. Much easier to catch an iguana in a smaller vivarium. Also catching them will be quicker and therefore less stressful to the iguana. You are trying to get it used to being handled and not to see you as a threat. Much better they get used to you opening the viv’ and just quickly picking them up than chasing them round a room first. The iguana comes from tropical and sub tropical America (mainly central and south). They like it warm and humid. A basking area hot spot of up to 48C dropping to 25 and the coldest end. Heating is best achieved with lamps although some background heating may be required in a larger enclosure. Importantly there must be a temperature gradient with areas for the iguana to sit in so it can move around the enclosure to regulate its body temperature. They do better with heat coming from above. A heat mat on the floor can result in thermal blocking with any larger animal so if using a mat for overnight temperature in a smaller vivarium, have it mounted on the end wall, off the floor so the iguana cannot lay on top of it and overheat. 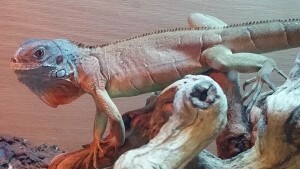 A UVA basking light for daytime heat and an infra red lamp or ceramic heat emitter for night time heat is ideal, although you do need to ensure the iguana cannot touch the lamp and burn. In the adult enclosure more than one lamp or heat source will be necessary. Only one may heat the animals head but it is 6 feet long so the body would not get any benefit. In other words increase the size of the basking area as the iguana grows. Keeping any animal at such high temperatures is almost impossible without some way of controlling the temperature. Ambient temperature is going to change. A heat source that achieves 45C on a cold winters night is going to be considerably hotter on a hot summers day so a thermostat is essential. Overheating will kill an iguana much quicker than it being kept too cool. An iguana is a diurnal lizards. They are active during the day (they have an organ under the skin on the top of their heads often called a third or parietal eye that detects light and some movement). An iguana will also require UVB lighting. This is not the light provided by the basking spot lamp (unless you use a combined heat and UVB lamp). Normal basking lamps DO NOT provided UVB light although some do provide UVA. UVB is essential for allowing the iguana to manufacture vitamin D3 in its skin. Vitamin D3 is used in the metabolism of calcium from the diet. Without a good source of UVB the iguana cannot get calcium from their food and their bodies will then start to scavenge it from the only source left which is the bones. This leads to metabolic bone disease (MBD) and can be fatal. It is even more likely in a growing iguana as the calcium demand is higher. Of course in the wild they are in full sunlight and you cannot get a better UV source than that (so taking your iguana into the garden on a hot summers day is a good thing – do make sure you don’t have toxic ornamental plants though). One thing often overlooked is that UVB bulbs and tubes, whilst they may carry on working as a light source, stop giving out UVB after a while (depending on which type). After 6 moths UVB tubes start to deteriorate and after a year are not producing any appreciable UVB light at all. You will need to change tubes at around 9 months usage, so make sure you record when you last changed the lamp. Also UV does not travel very far from the source. Having a lamp on the top of a 6 foot high enclosure and expecting the UVB to reach an iguana on the ground is beyond wishful thinking. You will need to provide a basking area close (around 12 inches) to the UVB lamp to ensure the iguana is getting enough to manufacture vitamin D3. This is OK as iguanas are mostly arboreal and so will spend most of their time on strategically placed branches and ledges. Substrate choice is always a subject that creates debate (or in a lot of cases out and out slanging matches). I have my own personal preferences and my own reasons for that choice and you may have yours. As I don’t know your choices and reasons I will give mine instead. Certainly for a smaller enclosure I prefer bark chips (also known as orchid bark). I like it as it looks natural and also as it can help maintain the humidity of the vivarium by retaining some moisture. There is a perceived risk of an iguana accidentally ingesting it and subsequent impaction but I have never known this and by using a large food bowl and disposing of uneaten, spilt food this can be avoided. Sometime I have mixed it with coir (coco fibres) to make it go further and sometimes added a layer of dead leaves or moss for an even more natural look, particularly when going the whole hog and setting up a naturalistic environment complete with detrivores to clean up the poop and waste food. However that’s a subject on its own so I won’t cover it further here. In a large adult iguana enclosure this can get expensive and lots of people use just newspaper. Normally I am not a fan as I don’t like the look of it and the animals cannot get a grip on the surface. However with iguanas they are not going spend enough time out of the branches for that to be a problem. I still don’t like the look though. Some people use straw or alfalfa pellets. Again not my favourite. There is little risk if ingested as, after all, it is just food. However any water spilt on it turns it to mush and it can then smell. Of course you don’t have to use anything in a large enclosure, just have a surface that is easy to wipe clean but do keep it clean! As already stated, an iguana needs branches and ledges to climb around on (hence the need for height in their enclosure). Artificial greenery (personally, I prefer silk plants to plastic) works well and looks good. If you are going to use real plants make sure they are not toxic as the iguana will at least try to eat them. Any thing purchased from a garden centre will have been sprayed with pesticide and may also have pesticide in the soil of the pot. Go organic. Whichever you choose, the more the merrier. A young iguana especially will appreciate the hiding spots. The iguana is a vegetarian, completely. Yes in the wild they are bound to eat the odd insect or slug that is on their food but only by accident. Feeding animal protein in any amount will lead to renal problems as the kidneys are overloaded. 90% of the diet needs to be green fibrous food such as rocket, lettuces, kale, dandelions etc. The other 10% can be made up of squashes, cucumber, grated carrot etc. and small amounts of fruit (ours love a bit of mango). Go easy on the fruit though, as too much can upset the stomach which is not good for the iguana and you are the one that has to clear up the resultant mess. There are also commercially prepared iguana packaged foods available. Whilst I would not advocate feeding these exclusively to an iguana, they make a good “cupboard staple” for those times when, for whatever reason, you just can’t get out to get some fresh food. Our iguana likes tortoise pellets now and then and since these contain calcium and vitamin supplements they make a good occasional treat. Supplementation of the food with calcium powder and occasionally vitamin powder will ensure a healthy iguana throughout its life. Whilst small, chop the food up quite finely. They don’t really chew as such and will swallow lumps whole, so keeping the pieces small will only help. Always feed good quality food fresh. Remove any uneaten food before it goes nasty and it is an artificially hot environment, it will go nasty quickly. Always provide fresh water daily. A bowl large enough for a youngster to get into is good. Regular misting will also help maintain humidity (which helps when shedding skin) and ensure youngsters are getting water to drink. You can adjust humidity further by moving the water bowl. At the cool end there will be less evaporation than in the hot end. With proper care and handling IGUANAS do make good pets. They do seem to get to recognise and interact with their owners and each has its own unique character. Unless you are very experienced though (and if you are you probably wouldn’t be bothering to read this) avoid getting an adult. If it hasn’t been properly looked after it is likely to be aggressive and such a powerful animal is going to do some damage. Always see and handle any animal first, before committing to buy. Above all appreciate you are taking over responsibility for the animal when you buy it and all that entails. If you are not sure you have the space, time and finances don’t. Angell Pets has some of the most highly qualified and experienced staff of any pet shop. The wide range of experience has been gained over many years from a variety of sources. However you cannot gain the experience we have from remaining in the shop all the time. George has already gained experience with a range of animals from around the world, having visited China, Thailand, Africa, the Seychelles and Assumption Island and most of Europe. On Sunday he sets off again on a new adventure to New Zealand to work in conservation over there. This follows on from the work he was involved with in 2013/2014 for the Seychelles Island Federation on avian conservation. So with George leaving us for at least a year we have had to have a shift round of staff. Billie has just completed her business A levels and has now joined us full time on a nationally recognised Level 3 animal care and management apprenticeship scheme. She will be taking over many of the duties of her brother in helping to manage the shop. With Billie in the shop during the week alongside Kim I should now be able to focus on other areas of the business such as marketing, after sales support and other important stuff like writing more care sheets, boarding and deliveries. Albert has agreed to take over Billies previous duties on Saturdays and Henry continues with his existing hours during the week and on Sundays. Both Henry and Albert are just about to start their A levels. So despite George jetting off again we will be able to continue as usual, offering all the services we currently offer, such as boarding, free local delivery, nail clipping, qualified advice and one of the widest ranges of pet products in Gloucestershire (and some of the best prices too!). Uromastyx lizards make great reptiles to keep, especially for those who do not want to feed livefood. These, often colourful, lizards are in a way the vegetarian equivalent of a bearded dragon (they belong to the same family), a similar size (some are smaller and one is larger) with similar heat and light requirements (a bit hotter though) and are almost as interactive (although some individuals can be a little shy). There are a number of different species (out of 18 in total plus sub species) of Uromastyx generally available. These all have similar environmental (check for your species on specific measurements) and food requirements. The natural range of the various species of uromastyx is north of the equator from north Africa round into the Indian sub continent. With the variety of sizes there is also a variety of maxium ages, with the Egyptian uromastyx generaly being the largest and longest lived. 15 years is a good average age for any uromastyx although 30 years has been reported for a captive specimen. Uromastyx need it hot and dry. Due to the high basking heat levels you will need a larger vivarium that for similar sized bearded dragon. This is not because the uromastyx needs more space as such (although I am sure it will appreciate it) but due to the need to maintain a sufficient temperature gradient for you uromastyx to effectivley thermo regulate. In a small viv. with such a high temperature basking area you will inevitably be raising the temperature across the whole viv. and your “cool end” will not be cool enough. We would recommend from 3′ to 6′, depending on species and size of the uromastyx. Personally I would recommend a wooden viv. that will keep the heat in, with a good quality thermostat to prevent overheating. Trying to keep the temperature up in a glass viv. that looses heat readilly could cost a bit in electric and the life cost of any pet should always be taken into consideration before getting one to avoid having to pass it onto a “resue center” when it becomes too expensive to maintain. 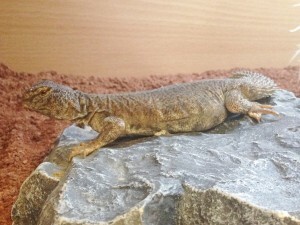 High daytime temperatures are very important to a uromastyx. They are a diurnal lizard (active during the day) and spend nightimes in a burrow away from predators. Night time temperatures can fall quite low, 18C (in a normal house you could switch all heating off at night or have a small heat mat if your house is consistently cold at night). Day time temperatures are kept high. Ambient temperature needs to be around 38C at the hot end and around 26C at the cool end with a basking spot temperature of 48 to 60C. In trying to keep a temperature this high it is essential to have correctly sized heat equipement and a good quality thermostat to prevent overheating your uromastyx. With all uromastyx the brightness of the lighting is also important so using bright incandescent or halogen lamps for the basking area heat is best. As said, bright daytime lighting is essential for a uromastyx. Not only does it stimulate feeding behaviour is also brings out the best colours. Generally the uromastyx colours only really show when they have heated up in bright light. UVB is also critical to the continued good health of the uromastyx. WIthout adequate levels of UVB they cannot absorb calcium from their diet and will get seriously ill. In fact on a really hot day (30C plus) a uromastyx will love basking in a secure area outside. You cannot get a better UV source than the sun! 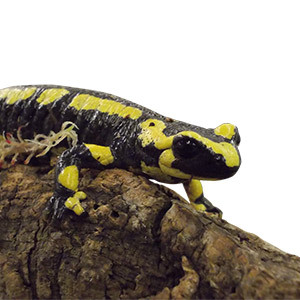 In the vivarium use either a minimum of a 10% UVB fluorescent tube (which will need to be changed at least every 9 months) or a combined heat and UVB mercury vapour or metal hallide basking lamp (these cannot be regulated by a thermostat so size correctly). It is a good idea to ensure there are multiple levels (use rocks or ledges) so not only can the uromastyx find a wider variation in temperatures but also so it can bask nearer to the UVB source (not too close if using a combined heat and UV source, it must not be able to touch it). UV light does not travel very far from the light source and the strength of the UVB rays deteriorates rapidly with distance. A deep substrate will provide burrowing media but hides placed around the viv. are a good supplement/alternative. Make sure any rocks cannot fall and crush your uromastyx and that hides are placed throughout the enclosure so the uromastyx can lay up at night and get out of the high temperatures during the day in a temperature needed at that point. 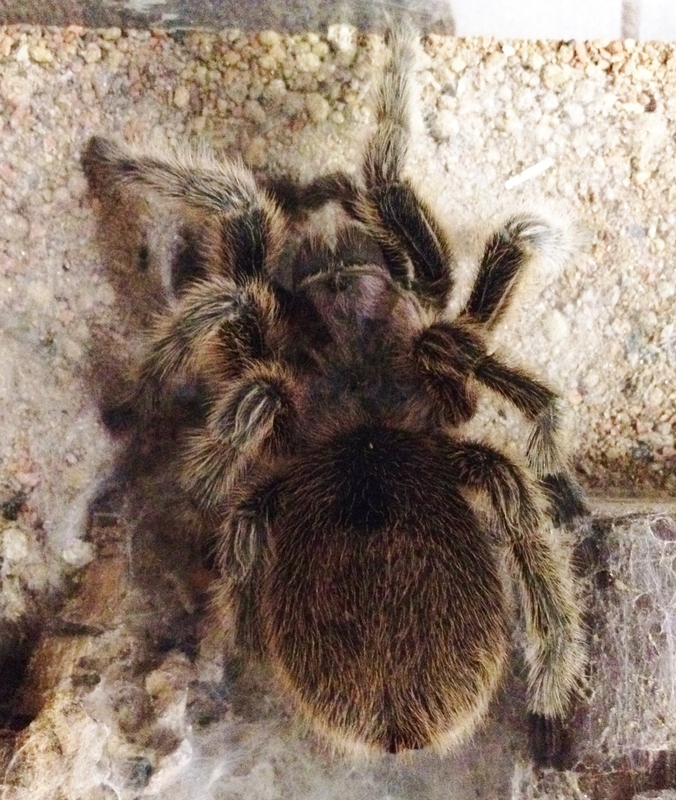 A deep substrate that can hold itself together and provide a burrowing medium is a good idea. We tend to use Lucky Reptile desert bedding as it can hold a bit of humidity at lower levels, so best replicates the wild environment. It also looks the part! I would avoid pure silica sand (play sand) as there is a higher risk of impaction and I don’t like calci sand myself for the same reason. Others do use these substrates and claim to have had no problems but I would rather avoid the risk. You can also use more utilitarian substrates but they do not have the structure to form burrows or localised humidity. In the wild, Uromastyx eat vegetable matter. In extremis they will eat insects but this is only done when vegetable matter is unavailable (drought conditions) and no alternative is available. The animal protein is thought to cause harm to the internal organs (especially the kidneys). In captivity vegetable matter is obviously always available so insects should not be given. A variety is best for your uromastyx. Green leaves such as rocket, unsprayed dandelion etc. are good for uromastyx. Avoid brassicas – cabbages etc. as these contain oxylates that bind up dietary calcium, making it unavailable to the uromastyx metabolism. Squashes, carrots etc (finely chopped or grated) can also be given and proprietary brands of herbivore food (usually sold for iguanas, tortoises etc.) make a good store room standby. Dusting food with a little calcium powder daily is a good idea but restrict vitamin powders to weekly as it is possible to overdose vitamins. If you are giving plenty of variation of fresh foods to your uromastyx additional vitamins will not be necessary more that once a week. If feeding a balanced, fresh diet a uromastyx will rarely drink water (some highland and coastal species may). You may wish to present a water dish once a week but do not leave it in the vivarium for too long (an hour is adequate) as with the high heat levels it will quickly evaporate and raise the humidity. This is harmless in the short term but leaving a water bowl in the vivarium all the time can be detrimental to the health of the lizard (consistently high humidity will make it susceptible to respiratory infection). I don’t bother with a water bowl. All the Uromastyx we have had have been docile. I have never been bitten or even tail whipped by one although anything with a jaw could bite I suppose. Consequently they make great “pets” although they should not be kept out of the vivarium for too long ( a couple of hours is fine) as they do need the high temperature and UV levels.